This is a guest blog post by Nancy Settle-Murphy, founder of Guided Insights, author of Leading Effective Virtual Teams and renowned expert in virtual collaboration and team communications, and Nettie Nitzberg, Principal of West5 Consulting, a people and organization development company. One executive I know was excited when she first joined her board, but things quickly took a turn. Minor misunderstandings, competing priorities and power differences between members made team communication devolve into uncomfortable exchanges that reflected mounting frustrations and distrust. Without any sign things would turn around, she felt hopeless. Fortunately, there’s a solution that can build a positive, collaborative environment for any team. It isn’t necessarily quick or simple, but the payoff can be tremendous. That solution is to create a Team Charter, which acts as a roadmap by which team members can see where they’re headed and how they want to get there. One critical aspect of a Team Charter is to outline ground rules and expectations when it comes to team communication through email, group chat, instant messaging, phone conversations, and in person interactions. While the new rules can make things seem overly formal or awkward at first, over time, communicating in the expected patterns become more natural. Ultimately this leads to a positive, collaborative work environment throughout the organization. 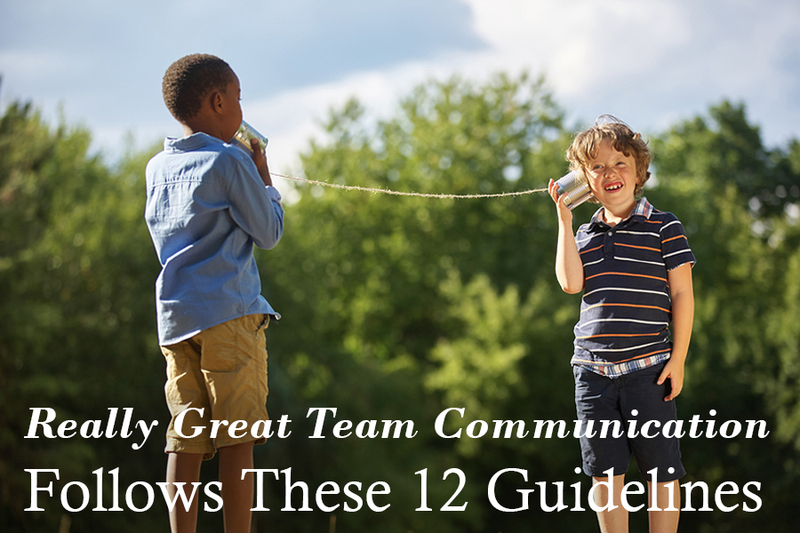 If you’re looking to build effective team communication in your organization, use these 12 guidelines to help you create a new Team Charter. One thing we’ve found especially helpful is to encourage people to share examples and stories, which can be a great way to convey values and beliefs. By facilitating a few such conversations, you’ll help guide your team in the creation of an agreed-upon Team Charter rooted in their shared beliefs. To what degree do we value open, clear communications? How will we demonstrate this? What communication ground rules are especially important for the team to live by? For example, to what extent is punctuality important? What level of responsiveness should we expect of each other when it comes to responding to requests? How important is it that we all use the same applications for common tasks? Under what circumstances do we use which form of communications, and why? For example, when is the team portal the best way to communicate, vs. real-time meetings, vs. group chats, IM, email, or phone? What information needs to be shared? With whom? What process will we use for sharing and accessing information? Does everyone on the team have equal access? In what ways do we want to communicate important changes, inside and outside of our team? What methods of communication will we use? Is it important that everyone hear the news at the same time? What do we hope to achieve during team meetings? What can real-time conversations help us do better than other forms of communication? How often will we meet, for how long, and at what time? Are meetings mandatory for everyone? Who sets the agenda? How will we communicate between meetings? How often? In what ways? How will we keep up to date on the team’s progress? How will we report progress and how often? How do we alert others that we’re in danger of missing an important deadline? How accessible do team members need to be, and how do we signal our availability? For example, if a manager sends an email during a weekend or vacation, are we expected to reply? If a team member is logged into the system, is it reasonable to assume they will respond to a request? How can we collaborate to create a team glossary so that everyone uses consistent terminology and a shared vocabulary? How do we determine which terms to use, considering our cultural differences? How do we assign confidentiality to our communications? What kind of information can be shared with others? What restrictions are important to uphold? When people come together to form a new team, they don’t just magically align. There are many trials and tribulations they must overcome to work together successfully. This takes a concerted effort, many candid conversations, and no small degree of compromise. By establishing a Team Charter up front, especially where differences are greatest, your new team will move out of the starting gate, together, far more quickly. Nancy Settle-Murphy is the author of Leading Effective Virtual Teams by CRC Press and a renowned expert in the fields of virtual collaboration, global teams, and planning and running engaging virtual meetings.